The Hawsons specialist corporate finance team have worked closely with 505 Mobile Srl, as lead advisors in the purchase of games developer, DR Studios. 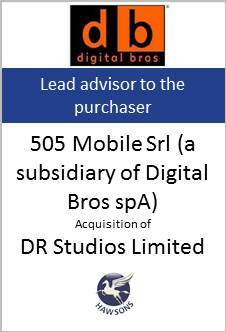 It was extremely satisfying advising 505 Mobile Srl on their acquisition of DR Studios; a deal which will allow the group to significantly increase its mobile development capability. DR Studios Ltd. is a developer of mobile app games in Milton Keynes, including ‘Monopoly Tycoon’ and ‘Hospital Tycoon’. The company also had a recent success with ‘Battle Islands’; generating over one million downloads in just 8 weeks.